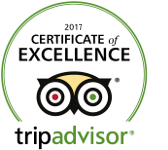 We are open all year round, and have 4 rooms. All our rooms offer private, en suite facilities. The house and all the bedrooms are non smoking. A stay of just one night incurs a 10 euro per room supplement. 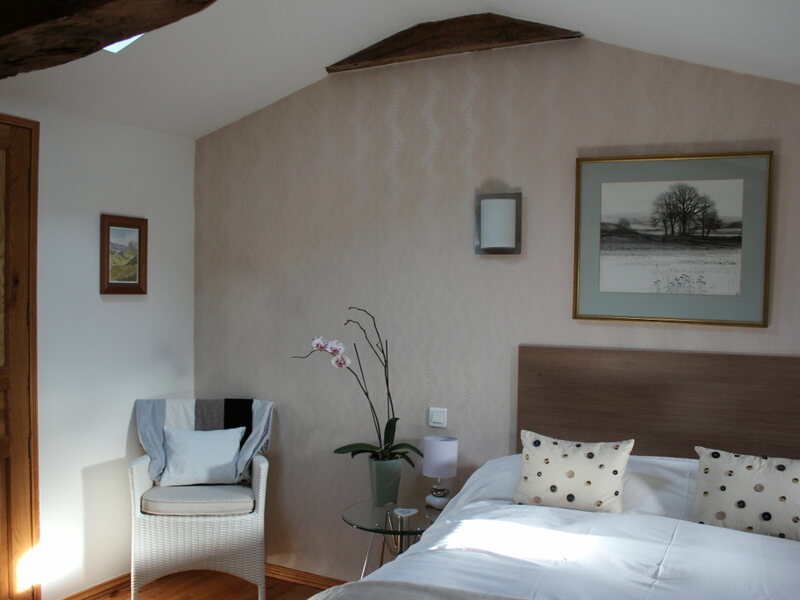 Double bedded room with chestnut beams and a window overlooking the garden. 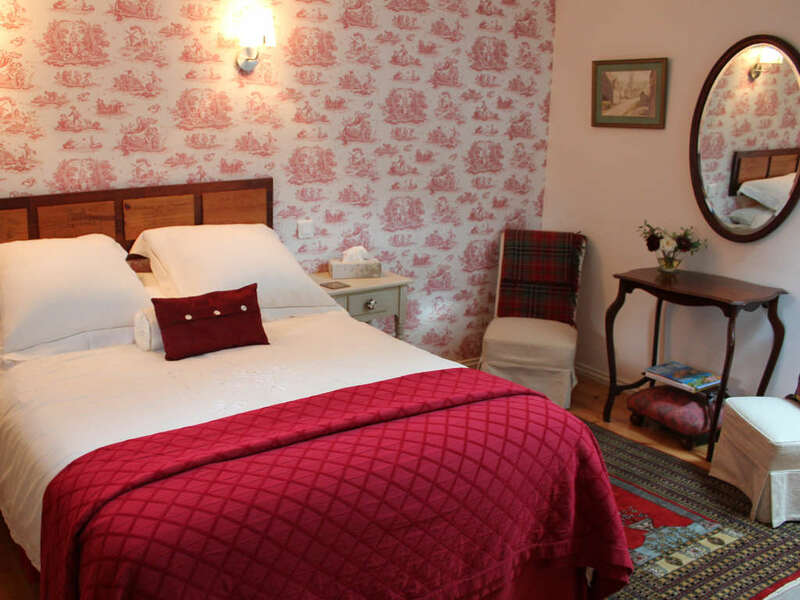 Rouge is priced at €75 per night. This includes a good continental breakfast. Evening meals are available on some nights, bookable in advance. Guests are offered a complimentary welcome drink on arrival. Blanc is priced at €75 per night. 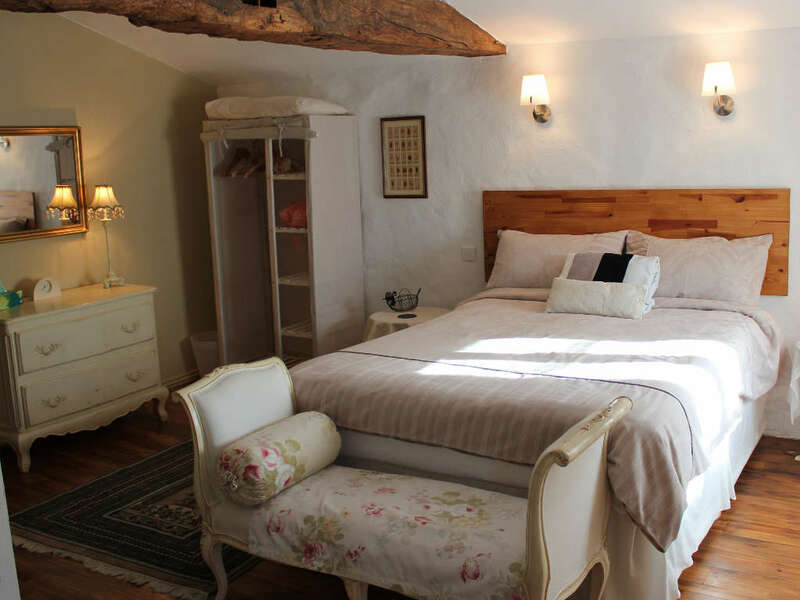 Double bed with windows overlooking the fig tree and gardens beyond, oak beams and small sitting area. Fizz is priced at €75 per night. 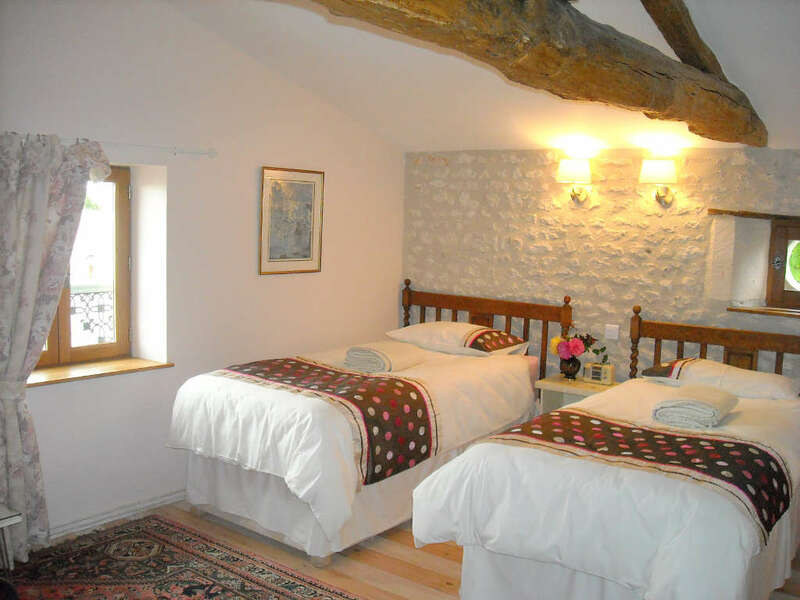 Triple bedded room, (twin beds plus a day bed suitable for children or an adult for a short stay) with chestnut beams and windows to the front garden and surrounding countryside. A cot suitable for babies up to 18 months is available free of charge - please reserve when making your booking. Complimentary tea and coffee making facilities are available in the guests' dining hall. We love pets but don’t allow them to stay in our rooms. Served between 7.30 and 9.45, our delicious continental breakfast includes croissants, breads, fresh fruit compote, creamy yoghurt, orange juice, jams, tea(s), coffee or hot chocolate and often other homemade treats, such as muffins or pastries. We offer table d’hôte on some nights, bookable in advance, €35 per person including an aperitif, wine with dinner and tea/coffee. A reduction is made for under 12s. With prior notification, some dietary requirements can be catered for. Please enquire when making your booking. A non-refundable deposit of 25% is usually required when making your booking, or 50% if booking within 4 weeks of your stay. We can advise on the easiest methods of paying this. On departure, accounts may only be settled in Euros or French cheques. On line! Payments in sterling can be converted to euros and paid on line, in advance, with Transferwise.com - please ask for details if this is your preferred option. We offer a 10 Euro discount off the room price for single traveller. Guests check in 16.30h - 21.00h (outside these times, by prior arrangement). Guests check out by 11.00h please - it's helpful for us to know in advance if this is going to be a problem for you! Deposits are non refundable. A failure to arrive or a cancellation of a booking taken at short notice and/ or where a deposit has not been paid, may incur a charge of 100% of the room rate and a charge for any dinner(s) requested for the first night.